San Diego Comic Con is upon us and among all the exciting comic book movie and television news that will inevitably be revealed at the event, in comes a slew of wonderful exclusive collectables for fans at the floor. Of course, you can expect countless action figures left and right, and Funko is no exception when it comes to their exclusives, and thankfully another wave of exclusive figures have been revealed and one of them is a brand new Funko Pop! Vinyl figure of Batman in commemoration for Suicide Squad (which is expected to have a heavy presence at the convention). 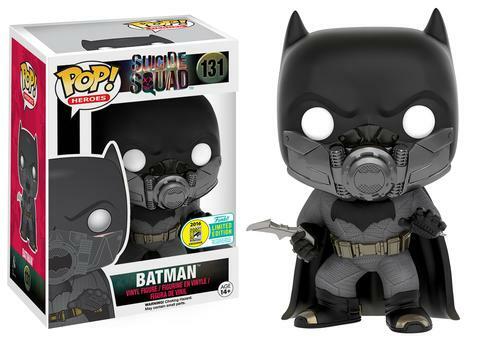 In a Periscope introducing Wave Seven of SDCC Funko products, the exclusive Batman figure was revealed. This depiction of the caped crusader showcases him in his underwater gear. There was a glimpse of Ben Affleck’s Batman sporting the getup in the Blitz trailer where he is shown diving into a body of water – where it seemingly looks like he’s rescuing Harley Quinn. For the many fans and collectors excited for David Ayer’s Suicide Squad, this new figure is undoubtedly a must-have for people at the collection floor. It also leaves one to wonder if we will see more variant figures of Batman from the movie. Suicide Squad hits theaters August 5. You can have a look at more of the first wave of Funko products related to the film here.